Harry Edwards once told the University of Florida’s men’s basketball team that to repeat as champions they had to push the rock up a hill collectively, not individually. Those back-to-back NCAA champion Gators were coached by Billy Donovan, who enlisted the renowned African-American sociologist for many words of wisdom. Now, in his first season with the Oklahoma City Thunder, a different Donovan team is facing a test in the national spotlight. This time, it’s a Game 7 on the road in the NBA Western Conference finals, after Oklahoma City failed in two straight chances to close out the series against the defending champion Golden State Warriors. Edwards, a former Black Panther Party member, has never stopped offering Donovan motivational words since the day they met, and he offered a pep talk for his good friend and the Thunder with Game 7 looming. “At this point, as usual, Game 7 doesn’t have a lot to do with ‘the other team,’ ” Edwards said. “It has to do with us, who we are, what we are made of, what we stand for as individuals, as a team, as an organization. The situation that OKC has created for itself is a one-game, sudden-death playoff scenario on the road that is most certainly formidable — but by no means insurmountable — so long as they realize and capitalize on the fact that this is not about the Warriors. In Edwards and Donovan, the sports world has a little-known, odd-couple friendship overflowing in mutual respect. Now an emeritus professor at the University of California-Berkeley, Edwards, 73, is best known for his criticism of racism in sports and being an advocate for black management in professional sports. The author of The Revolt of the Black Athlete, he currently serves as a consultant for the NFL’s San Francisco 49ers and formerly consulted for the Warriors. He was also founder of the Olympic Project for Human Rights, which led to the historic Black Power salute by two San Jose State track athletes, Tommie Smith and John Carlos, at the 1968 Summer Olympics in Mexico. “He understands a lot about competition,” Donovan said. “He shared stories about [ex-49ers stars] Joe Montana, Jerry Rice and Ronnie Lott, their mentality and what made them champions. A lot of times when the talent is equal, there is a mental approach that helps elevate you as a team. Donovan, 50, spent 19 seasons coaching Florida before being hired by the Thunder in the summer of 2015. The New York native led the Gators to back-to-back championships in 2006 and 2007 and is the winningest coach in school history. The three-time Southeastern Conference coach of the year had 16 straight 20-win seasons that included four Final Four appearances. A former point guard for the New York Knicks, he has coached such current NBA players as Bradley Beal, Matt Bonner, Corey Brewer, Udonis Haslem, Al Horford, David Lee, Mike Miller, Joakim Noah, Chandler Parsons and Marreese Speights at Florida. 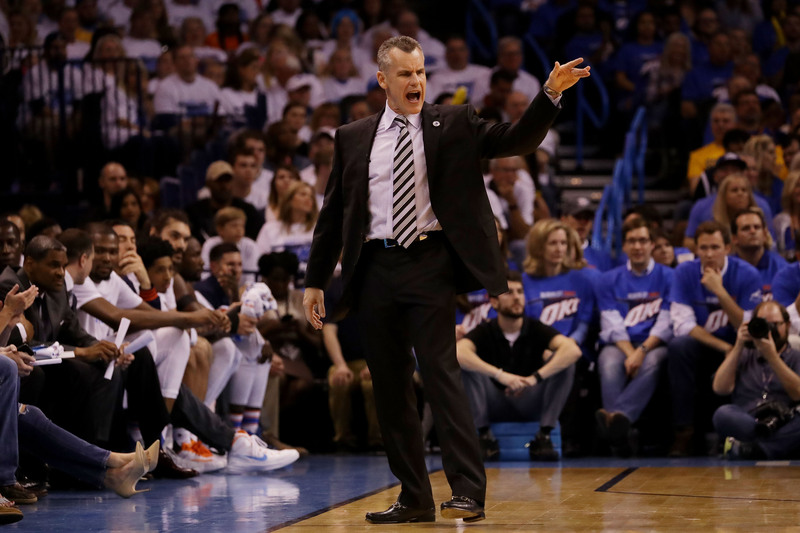 Head coach Billy Donovan of the Oklahoma City Thunder reacts in the fourth quarter against the Golden State Warriors in Game 3 of the Western Conference Finals during the 2016 NBA Playoffs at Chesapeake Energy Arena on May 22 in Oklahoma City. “He’s among the great ones,” Edwards said about Donovan. “He has that optimum mix of respect. The players are not fearful that he is going to put them in the doghouse, but they’re fearful of not wanting to go into the film room with him. They do not want to walk back to the sidelines after they’ve been on the floor and not have not done their jobs. He’s just a great coach and a better man than he is a coach. Edwards said he closely studied Walsh, the late Pro Football Hall of Famer, for 20 years and exchanged letters with Hall of Fame college basketball coach Bobby Knight. He also studied coaches who “made a significant mark” such as the late Green Bay Packers coach Vince Lombardi and ex-Utah Jazz coach Jerry Sloan. “Well, that’s awfully nice of him. I’m very humbled by that. [Edwards] is being a very nice man. [Walsh] has like three Super Bowls,” Donovan said. In his quest to squeeze knowledge from sports legends, Donovan had Hall of Fame basketball legend Jerry West, New England Patriots coach Bill Belichick and then-St. Louis Cardinals manager Tony La Russa speak to his Florida teams. He also told inspirational stories about Muhammad Ali, Michael Jordan, Tiger Woods and Pete Sampras, among others. The connection with Edwards began when the professor spoke on campus to Florida’s student-athletes in 2006. After a Florida assistant coach gave the talk a rave review, Donovan sought out the sociologist to see if he could help mentor his team mentally. Edwards willingly obliged. Edwards said Donovan believed his team was good enough to repeat as champions, but the main issue was “keeping everybody on track.” The two began establishing a bond over meals and phone calls. “Ever since that day we met, we’ve maintained a really good relationship,” Donovan said. The bearded, 6-foot-8 Edwards was a regular at Gators games as they went on to win that second national championship. Donovan and Speights still recall Edwards’ memorable speech about pushing a rock up a hill, collectively and not individually, in their quest to repeat as champions. Edwards also preached about teamwork, respect, how “hero ball” can eventually spell your doom and critiqued energy and body language from film. 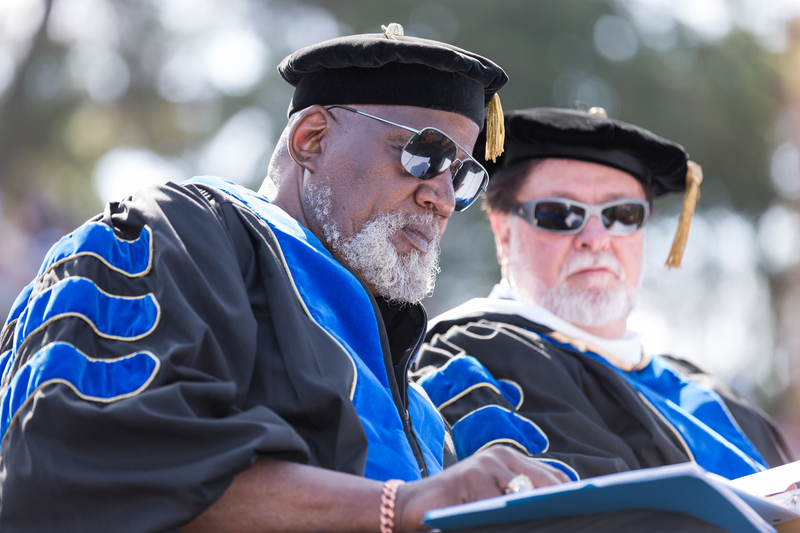 Harry Edwards at San Jose State University Commencement 2016. “He told us about going through the process and getting to the point to be at the top,” said Speights, now with the Warriors. “He talked about pushing up the rock. You have to do everything you need to do in preparation just to get to the rock. When you get to the rock, you have to pick it up through the process. You can’t do it overnight. Donovan also often used Edwards as a sounding board. To say thank you, Donovan gave Edwards a championship ring after the 2007 title. Edwards said he plans to donate the ring and other items from his personal collection to either the new National Museum of African American History and Culture in Washington, D.C., or to San Jose State, where he gave the commencement speech in front of Smith and Carlos on Saturday. Donovan infamously accepted an opportunity to coach the Orlando Magic in 2005 before changing his mind and staying at Florida. Edwards told Donovan that his NBA day would come, but it should be with a successful franchise in need of a spark to get to the next level. The Thunder, led by All-Stars Kevin Durant and Russell Westbrook, hired Donovan as head coach days after their season ended in 2015. Donovan said he sought advice from Edwards about how to adapt to coaching in the pros before he started with Oklahoma City. 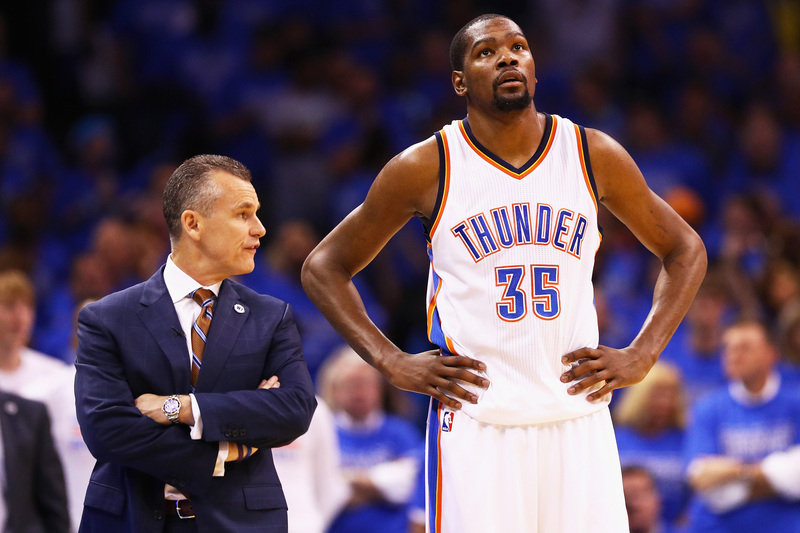 Head coach Billy Donovan of the Oklahoma City Thunder talks with Kevin Durant #35 during the first half in Game 6 of the Western Conference Finals against the Golden State Warriors during the 2016 NBA Playoffs at Chesapeake Energy Arena on May 28, 2016 in Oklahoma City, Oklahoma. Donovan faced his share of challenges this season. Assistant coach Monty Williams’s wife, Ingrid, died in a February car crash. Another assistant coach, Maurice Cheeks, had a lengthy absence because of hip surgery. And co-owner Aubrey McClendon died in a single-car crash in March, a day after being charged with conspiracy to rig bids for oil and natural gas leases. On the floor, though, the Thunder were a surprise, beating the No. 2 seed in the West, the San Antonio Spurs, and putting the top-seeded champs on the ropes. “You get a chance to learn, grow and develop. Eighty-two games is a long [regular] season. Being able to go from game to game in preparation, I really enjoyed it,” Donovan said. Edwards didn’t visit Oklahoma City during Donovan’s rookie NBA season since the latter was focused on establishing his own voice and environment. But expect a visit in the future. Considering their long relationship, perhaps some words he previously shared with Donovan could inspire the Thunder against the Warriors. “The one thing I really learned is the mental approach to competition,” Donovan said. “Just from a sociology standpoint as far as learning about his life and what he had gone through when he was younger and how he evolved. Being with Bill Walsh and the 49ers, so much of it is a mindset when you’re competing. Everyone is going to prepare.